Well, you see I love watching football and even more tennis which means over the past 5 weeks I was doing a lot of just that. But when it gets all to exciting and tense I need to either hide behind a pillow (like when you watch a scary movie) or concentrate temporarily on something else. I know it is pathetic and I have missed over the past years a lot of excellent Chelsea and Germany moments on the pitch and even more tennis points with this technique. But its the only way. 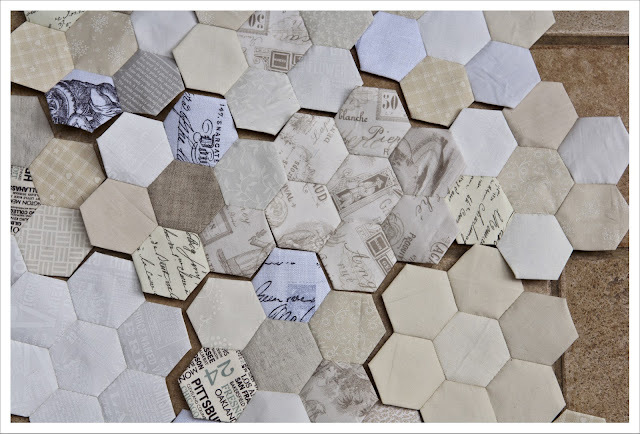 On the plus side it increases the number of hexagons for my neutral hexi quilt I started at the Fat Quarter retreat. This here is my magic black box that holds all I need for my hexis. This is the box opened. It's got my already cut squares, lots of finished hexis, my little rubbish basket for the cutoff corners and also my scissors and thread but I removed them to show you the inside of my magic box better. And this little pile plus all the basted hexis that are still in the box is the sum total of 5 weeks of Euro 2012 and Wimbledon. You can see that it was tense and in particular the tennis ! And lastly a few trial layouts ! 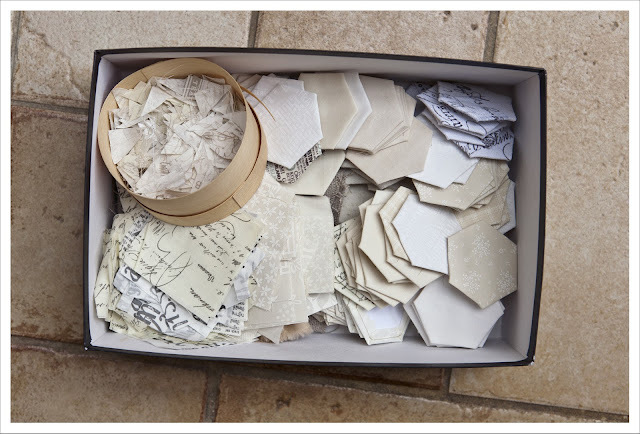 Do you see the hexi flower that is entirely made from the 'Tea Labels' fabric from Lakehouse Dry Goods ? That is a present from the lovely Fiona.... aren't I a lucky girl ! You can purchase the fabric at Simply Solids and also at Tikki. . I am so looking forward to the Olympics ! Mind you, when Usain Bold runs I'd better pay attention as it will be all over in 9 seconds ! If I sew and watch tennis, I invariably miss the good bits. These hexies are looking very good. Love the random rogue red hexie! Downunder, we get lots of stitching time watching the Tour de France! Yawn! 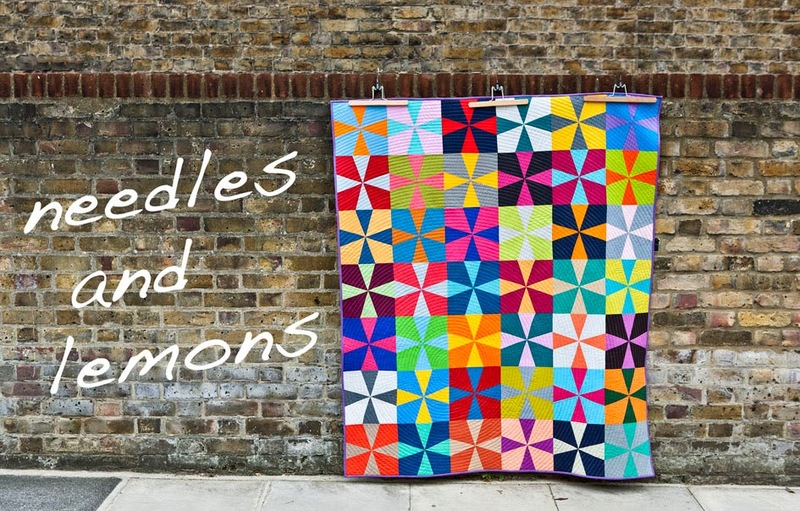 I love your hexies Judith - especially the single red one. 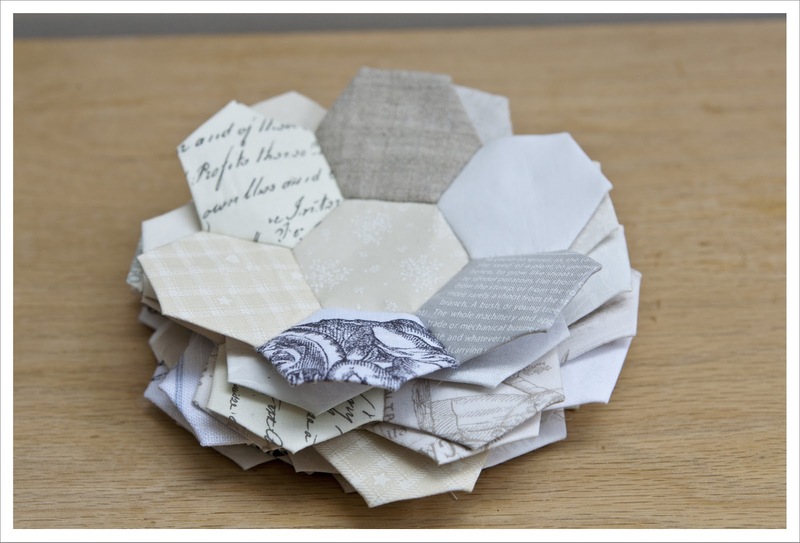 I have hexies going on as a sideline at the moment too - great for the sofa when I don't have to pay attention to the telly (or the husband!). Is that a camembert box you have housing your cut offs?! great idea to make sport more interesting! Though your hexies are making me think football rather than tennis! I love your hexies so far!! This nuetral hexie quilt is going to be a stunner for sure. I love that red hexie in the middle of one of the flowers! These are so cute. You are very talented.